SKS carries a variety of glass and plastic beverage bottles for housing an assortment of juices, smoothies, liquor, coffee, and more. 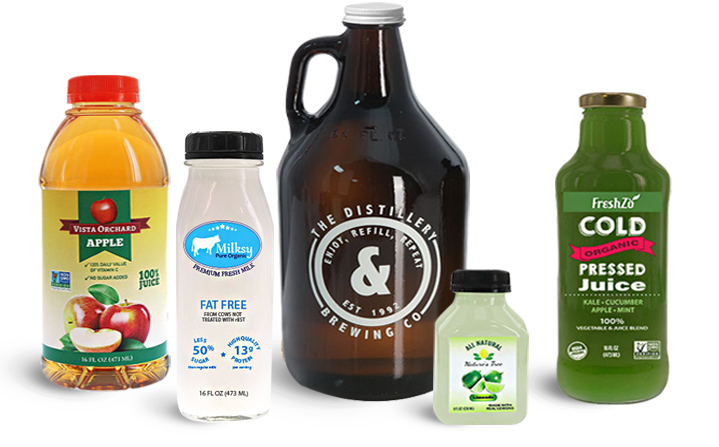 SKS offers a wide range of glass beverage bottles, paired with or without tamper evident cap options. Clear glass bottles with gold lug caps could be ideal for packaging fresh pressed juice or cold brew coffee. The gold metal caps include a plastisol liner, which adds a tamper evident feature by forming a hermetic seal that breaks when the juice bottle is first opened. Amber glass growlers offer UV protection, making them a great option for packaging light sensitive beverages, like craft beers. These glass jugs feature handles for easy transportation and pouring. The craft beer growlers are paired with phenolic caps with cone liners, which sits in the neck of the bottles and provides a secure seal. Swing top glass bottles are a popular packaging choice for hard cider, kombucha, and other homebrew products. These kombucha bottles feature an attached swing top assembly that includes a wire construction and plug cap. The plug cap offers a secure seal to prevent spills, and keep the product fresh and flavorful. Clear glass dairy bottles paired with black or white tamper evident caps offer a high-end, classic look. These milk bottles feature a large labeling area for custom branding. The LDPE plastic tamper evident caps include a ring that snaps off when the glass bottles are first opened. SKS also carries many plastic drink bottle options. Square plastic bottles are available in three sizes and can be paired with black, red, or white tamper evident caps. 16 oz tall square bottles are also available with either black, red, or white tamper evident caps. The square design of these plastic smoothie bottles offers easy gripping for on-the-go use. Round sports drink bottles are available in 10 oz or 16 oz sizes and feature wide label panel areas for custom branding. These PET plastic beverage bottles could be used to house health drinks, juices, tea, and more. Similar to the square bottles, the round bottles can be paired with a range of tamper evident caps for a secure beverage packaging option. 1, 2, and 4 oz clear PET plastic boston round bottles offer an alternative travel size container option for small dose beverages. These energy drink bottles are paired with white or black F217 lined caps. The PE liner creates a barrier against moisture and air, helping to keep product fresh. To assist in finding matching cap options for each of our containers, SKS created cap codes. These alphanumeric codes are unique to each of our cap, sprayer, dropper, and lotion pump sizes and are designed to correlate with the neck finishes of our bulk bottles and jars. Simply view the cap code listed for the desired bulk container, then search for the same code using our Cap Code Chart to determine which cap options fit. 1 liter clear glass liquor bottles are ideal for packaging spirits, like tequila, whiskey, bourbon, and more. These tall, glass spirit bottles feature a large labeling area for custom branding. The long slender neck assists with pouring smaller amounts at a time and features a tamper evident ring. When paired with black tamper evident caps, the frangible ring along the cap skirt snaps off against the tequila bottle neck after opening for the first time.